Gov. Linda Lingle appointed appeals Judge Katherine Leonard yesterday to become the state's fifth chief justice and the first woman to serve as head of the Hawaii Judiciary. Star-Advertiser. Governor Linda Lingle has announced the nomination of Judge Katherine Leonard to be Hawaii's next chief justice of the Hawaii Supreme Court. If approved by the state senate, Leonard would become Hawaii's first female chief justice. Hawaii News Now. Gov. 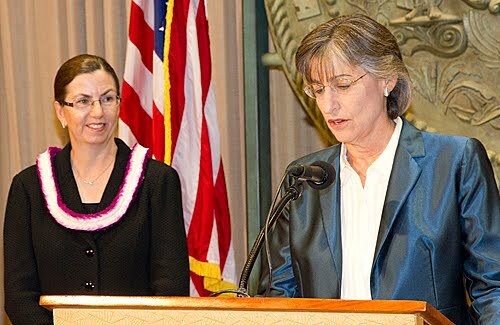 Linda Lingle has nominated Intermediate Court of Appeals Judge Katherine Leonard to be the next chief justice of the Hawaii state Supreme Court. Associated Press. About a thousand members and supporters of the UNITE HERE Local 5 hotel workers union showed up in Waikiki Thursday to protest against the Hyatt Regency Waikiki Hotel, with more than 80 of them arrested after they blocked Waikiki traffic. Hawaii News Now. Hawaii's two U.S. House members on Thursday split their votes on a bill to restore jobless benefits, an issue that may resonate with unemployed workers who go to the polls in November. Associated Press. The state labor department expects to process $10,000 retroactive claims, now that President Obama has signed off on an extension of unemployment benefits. KHON2. Honolulu voters have just less than two months to decide who should serve the final two years of Mufi Hannemann's term as mayor. Star-Advertiser. Looking back five decades to statehood, Honolulu mayors have marked many of the same political milestones en route to Honolulu Hale. Civil Beat. The special election in May to fill Hawaii's 1st Congressional District seat vacated by former U.S. Rep. Neil Abercrombie cost taxpayers $670,000, state elections officials confirmed on Thursday. KITV. Republicans, taking advantage of a state law that gives political parties extra time to find replacements for candidates who have withdrawn, have found a challenger to state Rep. Hermina Morita on Kauai. Star-Advertiser. State Rep. Mina Morita said even her Republican friends are upset about the 11th-hour competition Morita got in her bid for re-election to the district that runs from Wailua Houselots to Ha‘ena. Garden Island. It's a sign of the season. Politicians and political wannabe's signs and banners jockey for space on fences and walls. Hawaii News Now. Perhaps sensing voter discontent, political challengers have cropped up right and left this election year to try to unseat Maui County incumbents in the state Legislature. Maui News. Honolulu Councilman Rod Tam Thursday spoke for the first time publicly about being the subject of a criminal investigation. KITV. In Kahana Valley State Park, fresh taro and sweet potato sprout from a garden adjacent to a road made from dirt and small chunks of cement. Cinder blocks mark grave sites of kupuna. Some trees have been chopped down or burned, their rotten insides exposed. Star-Advertiser. Kilauea Volcano continues to put on a show that's delighting hundreds of visitors. KHON2. West Hawaii residents are breathing easier these days, thanks to reduced sulfur dioxide emissions from Kilauea's east rift eruptive vents and weather conditions controlling the dispersal, said Tamar Elias, gas geochemist at U.S. Geological Survey's Hawaiian Volcano Observatory. West Hawaii Today. Economist Paul Brewbaker of TZ Economics told a meeting of the Realtors Association of Maui this past Friday that the great recession is over and the economic expansion has begun. Lahaina News. Nearly 75 percent of the grading for Phase 1 of Ane Keohokalole Highway, known as the midlevel road, has been completed since its March groundbreaking, but work has been stopped until Aug. 15 because of the Hawaiian hoary bat, said Alex Leonard, project manager of Honolulu-based Nan Inc. West Hawaii Today. The driving time between downtown Hilo and Kaumana will be shortened under a proposal from Mayor Billy Kenoi's administration to boost the speed limit on the Puainako Street extension. Tribune-Herald. County Council members Wednesday approved a resolution urging the state Board of Education to reconsider its plan to consolidate three North Kohala schools into one K-12 school. West Hawaii Today. Maui Mayor Charmaine Tavares is demanding an apology from former Mayor Alan Arakawa over his comments during his radio show. Maui News. After seven months with no metal recycler on Molokai to dispose of junk cars and appliances, the County of Maui has secured a new contractor to run the island’s facility. Molokai Dispatch. It’s not often that the object of a spearfishing contest is to get rid of introduced, invasive species. Garden Island. A lawmaker in American Samoa has filed a lawsuit to stop the U.S. territory from spending money on Samoan Heritage Week in Hawaii without legislative approval. Associated Press.